Not long ago, I followed my daughter to Abercrombie and Fitch in a suburban mall.Â I and a legion of other middle-aged parents were fairly stunned by the throbbing background music and frenetic atmosphere. I was also fairly stunned by the high price of the clothes. Abercrombie and Fitch is now in court because the company declined to hire an otherwise qualified young woman because she wears a Hijab. Apparently she didnâ€™t fit the companyâ€™s preferred look. In every school there are the cool and popular kids, and then there are the not-so-cool kidsâ€¦Â We go after the cool kids. We go after the attractive all-American kid with a great attitude and a lot of friends. A lot of people donâ€™t belong [in our clothes], and they canâ€™t belong. Are we exclusionary? Absolutely. To paraphrase Barry Goldwater, every attractive all-American kid should deliver this guy a swift kick in the pants. Our kids, particularly our daughters, are forced in so many ways to contend with a predatory commercial culture that reinforces the most crummy and stupid aspects of adolescent life. As adults, this is partly our fault. We bankroll many purchases in stores that canâ€™t be bothered to sell a pair of pants to somebodyâ€™s wonderful 16-year-old girl who wears plus-size pants. I have no idea whether Abercrombieâ€™s various policies violate various employment laws. I know that this company that doesn’t deserve my money. If every parent did the same, maybe the people hawking stuff to our kids would at least pretend to some basic decency. For the fourteen years that I knew my mother-in-law Janice, she would sit at her computer for hours doing her bookkeeping working or just playing solitaire. Her son Vincent would sit quietly beside her, keeping her company. Then Janice passed away. Pretty soon, he kept Veronica and I company in the same way, for the time he lived with us. More recently, for the almost-six years that he has lived in a group home near our house, he has sat quietly beside the night manager Carol, while she has done her own computer work and play. Carol and Vincent have a special relationship. Carol has firm opinions about things. She and Vinnie squabbled frequently, often when he was caught cutting corners on some rule. We sometimes squabbled with her, too. Thereâ€™s awkward negotiation and role conflict regarding various details of Vincentâ€™s care. She was away for awhile on sick leave after some surgery. The guys missed her terribly. We called her last weekend to get a phone number. She surprised us with the news that she will be leaving her position. Like so many black women caring for other peopleâ€™s loved-ones, sheâ€™s had to move on. Not for the first time, no one quite knows the right thing to say. â€œThank you for everythingâ€ is essential, but leaves so much unsettled and unsaid. Through circumstances that were beyond her control, she would not be able to say goodbye in person. So she asked one thing: Would we please tell Vincent that she will miss him terribly, but that she wonâ€™t be able to see him anymore. Would we also say goodbye to my two daughters, whom she has come to know? Veronica and I spoke with Vincent about it. A staff member had already gotten the guys together. She broke the news to them, rather in the way one tells small children about the death of a close relative. Vincent is resilient and hungry for human connection. So he will soon find a new person to keep company with before he kicks in for the night. Vincentâ€™s not saying much about it. Thatâ€™s his way. Iâ€™m helping him pen a goodbye card, as weâ€™ve done when others have passed through his life. Given the low pay and the difficult working conditions in direct care work, heâ€™s experienced this before. Great to have someone who can actually sing capture the mood of this beautiful, melancholy song (h/t Sam Bagenstos). My bro-in-law Vincent was in a bad mood the other day. He was irritated, and I wasn’t as sympathetic as I might have been. He was frustrated because he was defeated by one of life’s unimportant but aggravating logic puzzles that plague him like a stumbling-block before the blind. It’s difficult to grasp–let alone convey–the human experience of living with an intellectual disability. In any event, there’s no single common experience to convey. People living with intellectual disabilities have such varied challenges, personalities, and life circumstances. There is one common thread. Intellectual disability is a pain in the neck.Â Imagine, if you will, that you are visiting Starbucks. Your barista has just prepared your favorite skinny mocha latte. She has it right there. She’ll be happy to hand it to you–right after you solve this Rubik’s cube and then reset your iCloud password and settings. Yeah, it would be pretty annoying, constantly having to solve lots of hard and annoying little logic puzzles just to make it through the day. No policy memo or psychometric scale can capture the tactile experience of private sadness, trauma, and loss. For that, we need the literary or the biographical imagination. Richard Fordâ€™s Sportswriter trilogy is ostensibly about many things. Yet as Stephen Metcalf observed in Slate, these books are really about the shattering (and then the gradual, only-partial reconstruction) of protagonist Frank Bascombeâ€™s life brought about by the death of his young son from Reye’s syndrome. â€¦when you have a child dieâ€”as I did nineteen years agoâ€”you carry him forever and ever after. Of course you should. And not that I â€œtalkâ€ to him (though some might) or obsess endlessly (as his brother, Paul, did for years until it made him loony), or that I expect Ralph to turn up at my door â€¦ (Iâ€™ve fantasized that could happen, though it was just a way to stay interested as years went by). For me, left back, there has been no dead-zone sensation of life suspended, hollowed, wind-raddled, no sense of not leading my real life but only some consolation-prize life nobody would wantâ€”Iâ€™m sure that can happen, too. Though what has developed is that my lifeâ€™s become alloyed with loss. Ralph, and then Ralph being dead, long ago became embedded in all my doings and behaviors. And not like a disease you carry that never gets better, but more the way being left-handed is ever your companion, or that you donâ€™t like parsnips and never eat them, or that once there was a girl you loved for the very first time, and you couldnâ€™t help thinking of herâ€”nonspecificallyâ€”every single day. And while this may seem profane or untrue to say, the life itâ€™s made has been and goes on being a much more than merely livable life. Itâ€™s made a good life, this loss, one I donâ€™t at all regretâ€¦. Of course Ralphâ€™s death was why Ann and I couldnâ€™t stay married another day seventeen years back. We were always thinking the same things, occupying and dividing up the same tiny piece of salted turf, couldn’t surprise and please each other the way marrieds need to. Death became all we had in common, a common jail. And who wanted that till our own deaths did us part? There would be a forever, we knew, and we had to live on into it, divided and joined by death. And not that it was harder on us than it was on Ralph, who died after all, and not willingly. But it was hard enough. Everyone–myself no more or less, particularly, than anyone else–experiences sadness and loss. Thank God these losses rarely stem from a childâ€™s death in the year 2014. Still, we mourn now-gone parents, siblings, friends, and spouses. We undergo painful divorces and romantic disappointment. We lose jobs or experience economic hardship. We watch people succumb to cancer or AIDS. Someone we love suffers because of one, randomly awful, repeated genetic sequence. These aching experiences sometimes strengthen us. They sometimes diminish us or leave us vulnerable in unexpected ways.Â Whatever they do to us, they become part of us, embedded in our lives. Although we might give anything to have avoided these misfortunes, at some point we canâ€™t fathom what our lives would be like without whatever theyâ€™ve left behind. CS Lewis informs us that this is the way God does his work. The blows of Godâ€™s chisel, which hurt us so much, ultimately sculpt something better in us. Maybe so, though I’m not much for apologetics. Like Frank Bascombe, I wish there were some other way. When you are white in America, anything is possible…. Last week, I attended the American Society of Criminology annual meetings. (Mark Kleiman, Johann Koehler, Keith Humphreys, and others were also in attendance.) My friend Peter Reuter and I got bored and decided to take a walk. Not far from the conference, we encountered the Moscone convention center. A door was propped open. So we went inside. We spotted some sort of football-field-size convention hall at the bottom of a long escalator. We went inside, where we encountered people setting up for a big auto show. There were maybe one hundred Porsches, Ferraris, and other fancy sports cars, classic cars from the 1930s, and more. We strolled around for about thirty minutes, taking pictures among the people polishing the cars. It was a very pleasant self-service private session at an upcoming auto show of some kind. We wore our ASC conference badges, which of course had nothing to do with whatever everyone else was wearing around us who were actually supposed to be there. We left the same way we came in. No one gave us a second look. Maybe they would have given us one of the cars, if we had only asked for the keys. Author Harold PollackPosted on November 29, 2014 November 29, 2014 Categories Crime & Incarceration, Personal momentTags Personal moment6 Comments on When you are white in America, anything is possible…. Who will help that man? It’s amazing what we learn to walk past in big-city (North) America. Almost fifteen years ago, we took my daughters on a Toronto vacation. They were very young. The city I wanted to show them was the beautiful, somewhat imaginary place I remember from my own youth. In my mindâ€™s eye, Toronto remains a squeaky-clean and safe counterpoint to gritty Rochester, Buffalo, and New York. This image was never fully accurate, even decades ago. Certainly today, Toronto faces every American urban challenge that doesnâ€™t involve handguns. 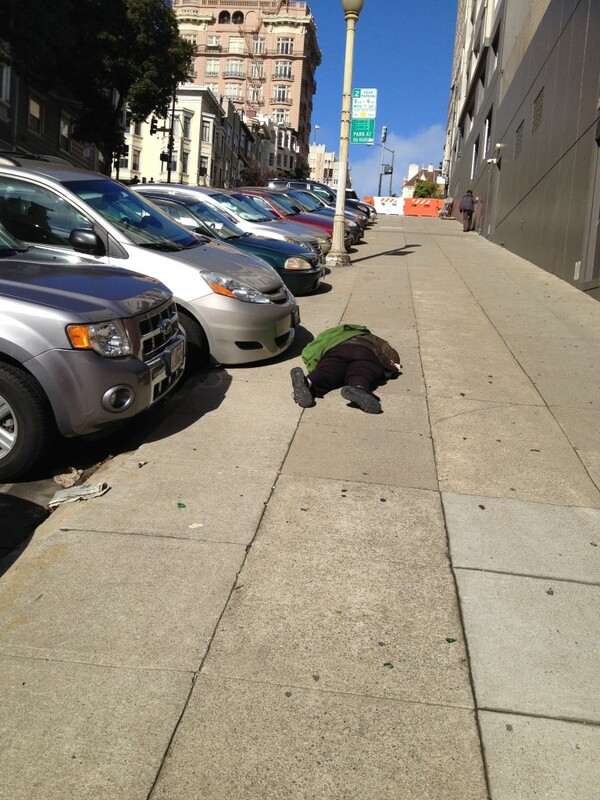 We walked out of our fancy hotel for sightseeingâ€”and immediately encountered a homeless man sprawled on the sidewalk. He was sitting on a dirty blanket. He was wet and cold on a blustery morning. With the stabbing innocence of a six-year-old, my daughter asked: â€œWho will help that man?â€ I stammered some crummy answer Iâ€™ve now forgotten. We were out-of-towners. He was right outside a major hotel in plain view of police and others. We didnâ€™t know his story. We had places to go, sights to see. What else could we really do? We moved on. 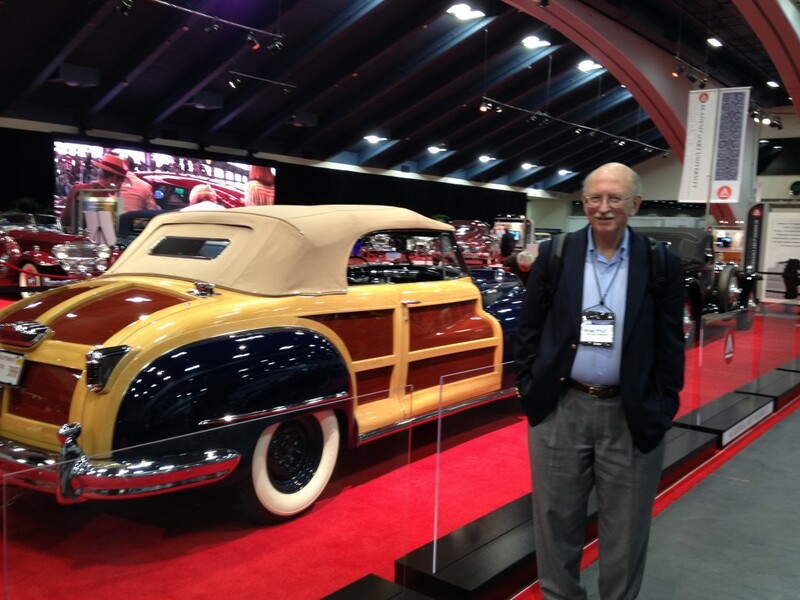 Just last week, I attended the American Society of Criminology in San Francisco. I love that city, perhaps the most beautiful and prosperous urban jewel America has to offer. It also has an amazing number of homeless people, many of whom lay under blankets right outside the doorways of internet start-ups and fancy condos. This Saturday, I was walking up Powell Street, headed to a fancy expensed lunch. I encountered this man. Yeah, it was a start. A head popped up. A man smiled. â€œYes, Iâ€™m fine.â€ His hair was knotted, and he was dirty. But he was happy and alert. He didnâ€™t seem drunk, immediately ill, or high. I asked if he was hungry. Could I get him anything? Did he want a sandwich? Nope. He just wanted to nap on the warm sidewalk. We talked for a few moments. Satisfied that he was immediately ok, I moved on. Fifteen minutes later, I ordered a $15 chicken sandwich. There was a touch too much pesto. That’s not the way I like it. Author Harold PollackPosted on November 27, 2014 November 27, 2014 Categories Everything ElseTags homelessness, Personal moment1 Comment on Who will help that man? Maybe greatest cultural cross-over country song title ever.